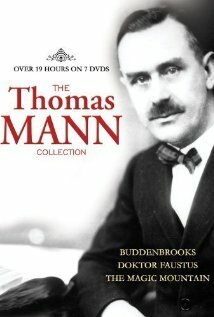 Included in the seven-disc box set THE THOMAS MANN COLLECTION (2007, now out of print) with Franz Peter Wirth's epic 10-hour miniseries of BUDDENBROOKS and Franz Seitz's three-hour feature of DOCTOR FAUSTUS (starring Jon Finch as composer Adrian Leverkuhn) is this frustrating but nevertheless remarkable three-part miniseries directed by Hans W. Geissendorfer, based on Mann's splendid 1924 novel. 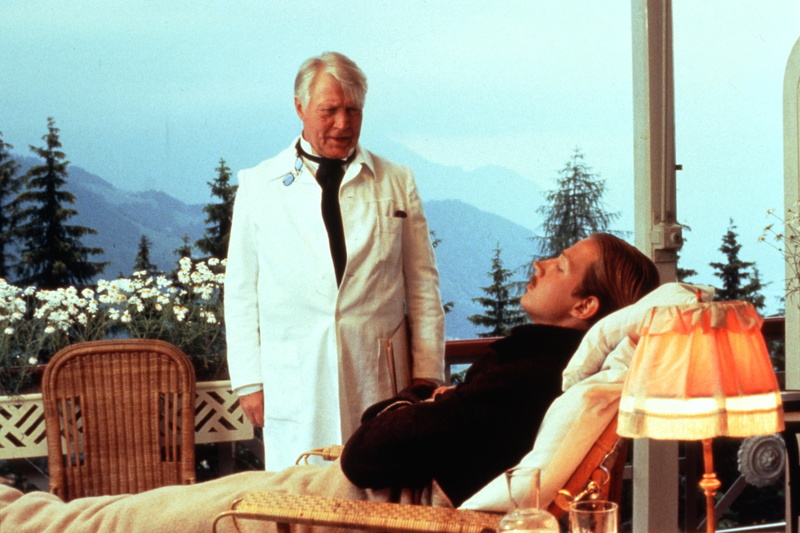 It's the story of Hans Castorp (Christoph Eichhorn), a young engineer who ascends a mountain to a sanatorium in Davos, Switzerland where his cousin Joachim is being treated for tuberculosis. Intending to stay for only three weeks, impressionable Hans finds himself affected by the elevation, which diverts him from his schedule to undergo treatment himself; various characters who undertake the reshaping of his malleable personality; and the reassuring routine of the place, which abstracts time, each day following the pattern of those previous, and causes him to become passive and detached even when confronted with the first, and possibly only, great love of his life, a fellow patient named Clavdia Chauchat (Marie-France Pisier, miscast but not fatally so). As the story continues - with Hans remaining at the sanitorium a full seven years, until the outbreak of World War I - the clinic becomes an increasingly surreal metaphor for the European passivity, decadence, morbidity and surfacing territorial hatreds that climax in an almost biological need to purge itself through a declaration of war. Even at slightly under seven hours, this epic can't begin to cover all the ground as the novel and inevitably disappoints, obviously cutting back the tense philosophic and political debates between Settembrini (SUSPIRIA's Flavio Bucci) and Naphta (Charles Aznavour) and sometimes rewriting character interactions to the detriment of its suspense. (In the novel, Hans and Clavdia have no direct interaction prior to the Mardi Gras party; here, she actually reprimands him for gazing soulfully at her.) However, approached as a complement to the novel, the film reproduces more scenes and settings with fidelity than one would ever believe possible and, by virtue of some serendipitous casting, allows some of Mann's fuzzier characters blossoming into unforgettable characters. Particularly noteworthy in this regard are Ann Zacharias as the luminous medium Elly Brand (in Prt 3's séance sequence, one of the most convincing possessed women ever filmed), Fassbinder favorite Kurt Raab (THE TENDERNESS OF WOLVES) as the closet occultist Dr. Krokowski, and most of all, Gudrun Gabriel as Marusja, Joachim's unspoken love. (Her moment at the end of Part 2 is heart-rending, and made me think Marusja went on to marry Mr. Crich, becoming the character Catherine Willmer played in Ken Russell's WOMEN IN LOVE.) Rod Steiger also turns up in the final third as the pivotal Myneer Peeperkorn, but what appears to be an inspired performance is undercut by German dubbing and English subtitles that complete what should be a chronic inability to form coherent sentences. Lensed by later Scorsese collaborator Michael Ballhaus, THE MAGIC MOUNTAIN is preserved by this 2007 release in a dated, standard, analog transfer that stutters during panning shots, yet it remains the definitive release to date. A 2010 stand-alone, two-disc release from E1 Entertainment, which looks worse, also condenses the production to feature length (153m) with disastrous results. A four-disc edition, with supplementary materials, was issued in Germany last year that I've heard renders a more definitive presentation and includes a 1.78:1 anamorphic transfer of the feature version - alas, it's not English friendly.